The US wind industry installed an impressive 7 gigawatts of new power capacity in 2017 and drove $11 billion worth of new private investment, according to a new report published by the American Wind Energy Association. Even more impressive was the 29 new wind farms totalling 4,125 MW (megawatts) that came online across 16 states in the fourth quarter alone. 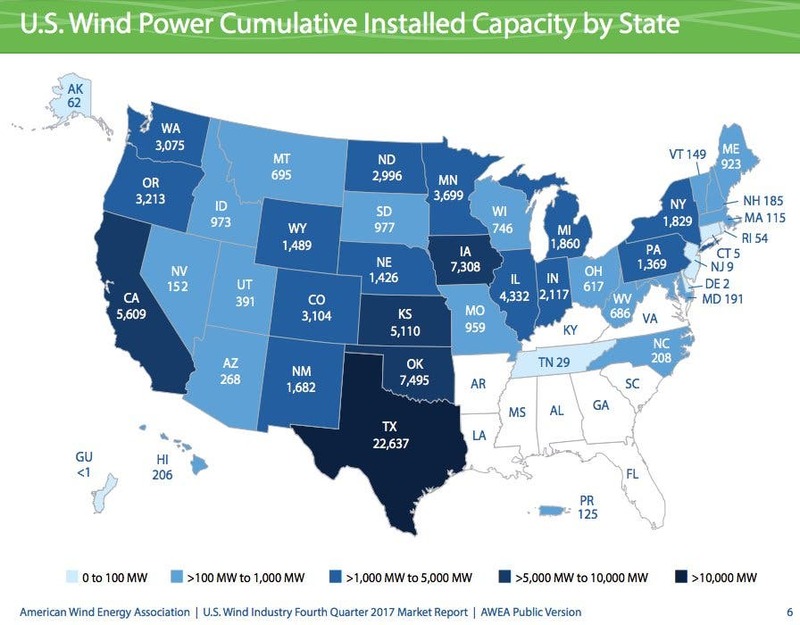 The American Wind Energy Association (AWEA) published its U.S. Wind Industry Fourth Quarter 2017 Market Report on Tuesday, highlighting the 7,017 MW of new wind brought online during 2017, bringing the country’s cumulative total wind energy capacity up to 89,077 MW spread out across 41 states, and representing enough electricity to power 26 million homes. On top of new installed wind capacity, the report highlighted an additional 2,136 MW worth of partial repowerings that were completed during 2017. There is also another 28,668 MW worth of wind farms in the pipeline in various stages of construction or advanced development, a 34% increase compared to the end of 2016. This figure included 5,393 MW worth of new announcements made during the fourth quarter. According to the AWEA, a total of nearly 5,500 MW worth of Power Purchase Agreements (PPAs) were signed during 2017, an increase of 29% year-over-year, with corporate and other non-utility customers signing all 710 MW worth of PPAs announced during the fourth quarter. A total of 29 new wind projects were commissioned across 16 states in the fourth quarter, totaling 4,125 MW, and was led by Texas which installed 1,179 MW, followed by Oklahoma with 851 MW, Iowa with 334 MW, Illinois with 306 MW, and Missouri with 300 MW. For the full year 2017 Texas installed a total of 2,305 MW, followed by Oklahoma with 851 MW and Kansas with 659 MW. 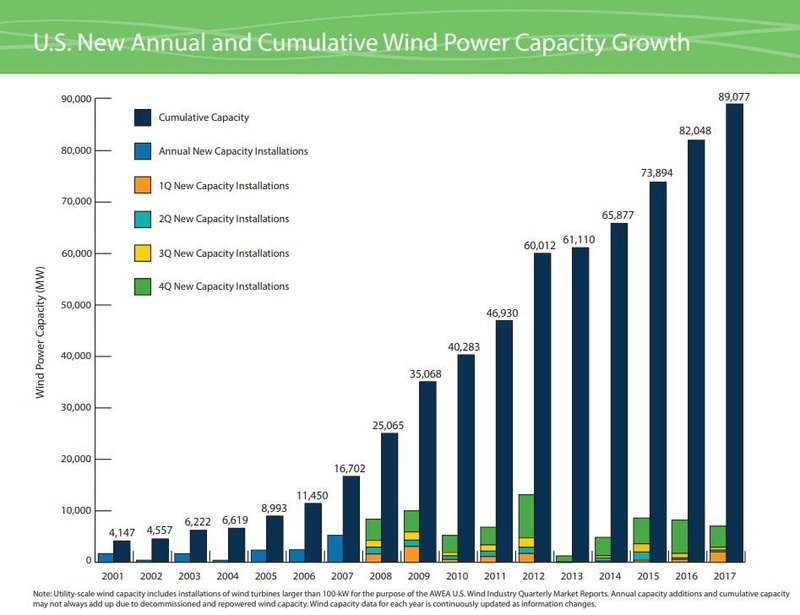 Texas also continues to lead overall with a cumulative capacity of 22,637 MW. However, the second place is now held by Oklahoma with 7,495 MW, surpassing Iowa which now has 7,308 MW.